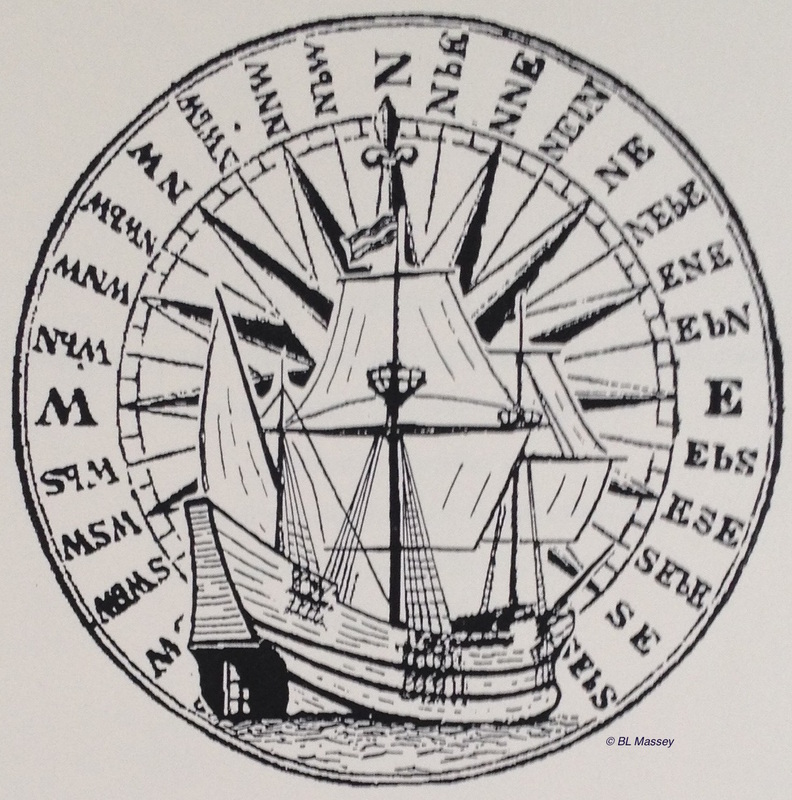 Are you having trouble finding the origins of your New Netherland ancestors? 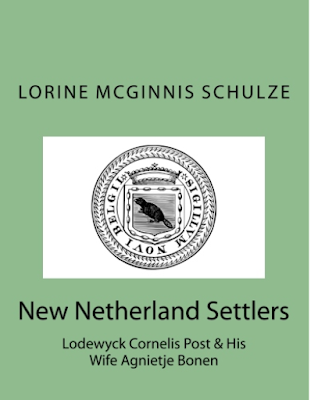 My new book in my New Netherland series is now available for purchase. 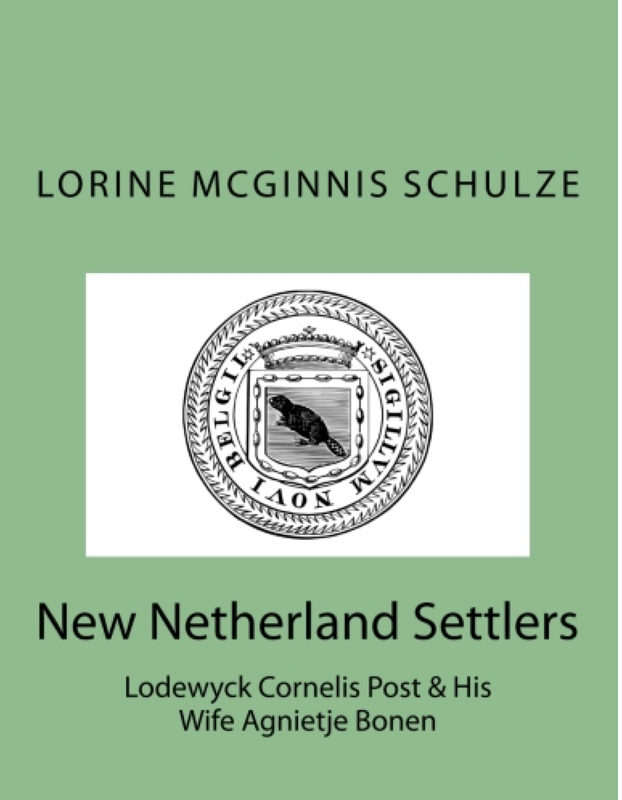 Sometime between October 1647 and July 1652, Lodewyck Cornelils Post, his wife Agnietje Bonen, and their children left Amsterdam Holland to settle in New Netherland (New York). Research into Naarden Holland church records has revealed Lodewyck’s birth and his parents’ marriage in that city. When Lodewyck and his family arrived, New Amsterdam’s population was just over 600 people and it was growing rapidly. New Amsterdam’s gabled homes, the Dutch language being spoken, and Dutch laws in place would have offered comfort to newly arrived Lodewyck and Agnietje. 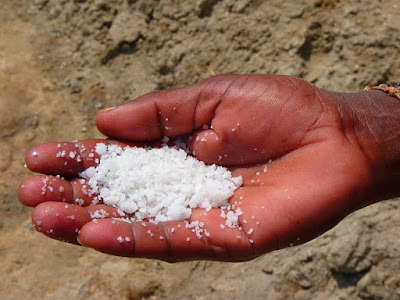 Following is a repeat of an older blog post I wrote that think is important to revisit because we all need to remember this as we search for our ancestors. The gravestone belonged to Jabez Harden, born 1796, died 1879, veteran of the War of 1812, but he is not buried there. His original grave is in Pratt Town Cemetery in Bridgewater. The mystery is how did Jabez's tombstone end up in a basement? Above you can view Jabez's widow's Pension application dated 1879. The Peer family were loyal to the British Crown, and suffered from persecution in New Jersey throughout the American Revolution. 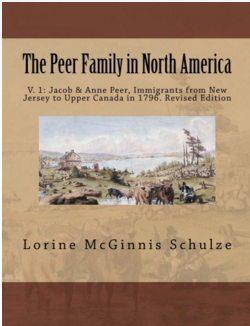 Jacob and his family left Sussex County New Jersey for Upper Canada in the summer of 1796. 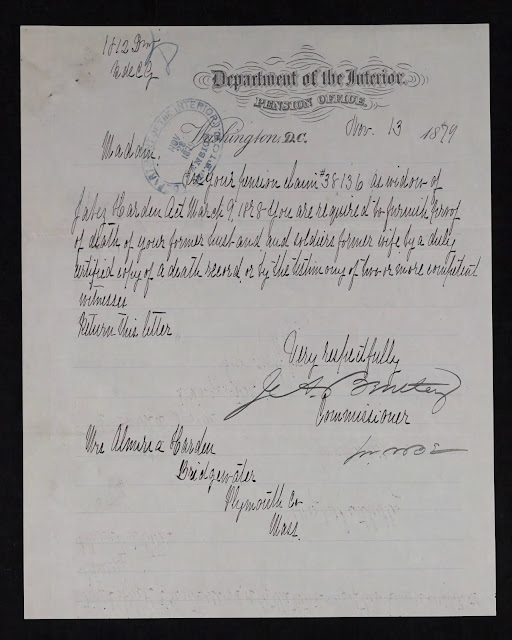 Four of Jacob's sons - Jacob Jr., Edward, John and Philip Peer petitioned for land one year later. They settled in the Hamilton area of what was then the wilderness of Upper Canada. This book discusses the lives of Jacob, his wife and their children in those early years. Descendants will enjoy seeing early documents such as land petitions and wills. Be sure to watch this Sunday’s episode of Who Do You Think You Are? featuring actress Molly Ringwald. Actress Molly Ringwald travels to Sweden to dig up her mysterious paternal roots. She explores her ancestors’ harrowing lives as coal miners; discovers generations who suffered through unspeakable tragedies; and uncovers the gripping life of a brave relative who forever changed her family’s fate. The two-time Emmy nominated series WHO DO YOU THINK YOU ARE? returns this spring to follow more of today’s most beloved and iconic celebrities as they embark on personal journeys of self-discovery to trace their family trees. Labels: Ancestry.com, Molly Ringwald, TLC, TV Shows, WDYTYA, Who Do You Think You Are? My husband's great-great grandfather's brother Robert Facey was the manager of the Canada Cheese Factory. Robert's claim to fame is that he supervised the production of the Mammoth Cheese in 1866. A mammoth press was designed that would be used by Robert Facey at James Harris’ cheese factory to produce the 7,300 pound mammoth cheese. 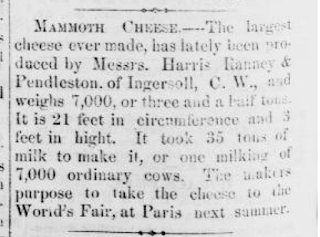 When it was ready to be shipped to England, James Noxon was ready to financially support the creation of the Ingersoll Cheese Company which sponsored the cross-Atlantic voyage in 1866. 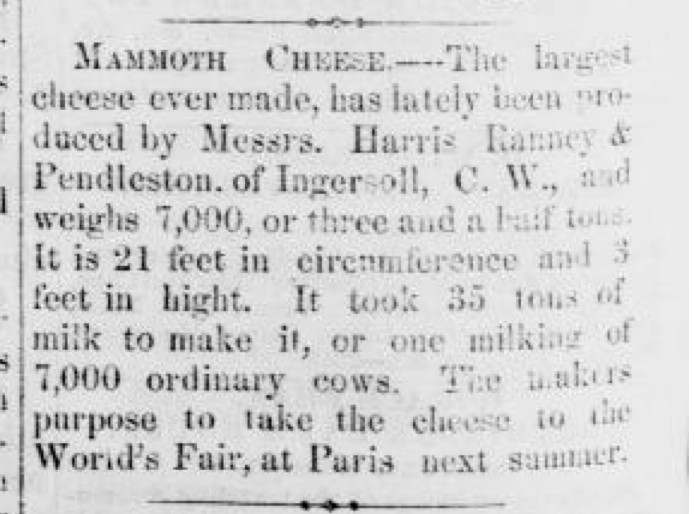 Library and Archives Canada (LAC) has a very interesting page about Mammoth Cheeses in Ontario. Even though I was born here and have lived in Ontario all my life I never knew we were such amazing cheesemakers - a skill seemingly lost to our province now. 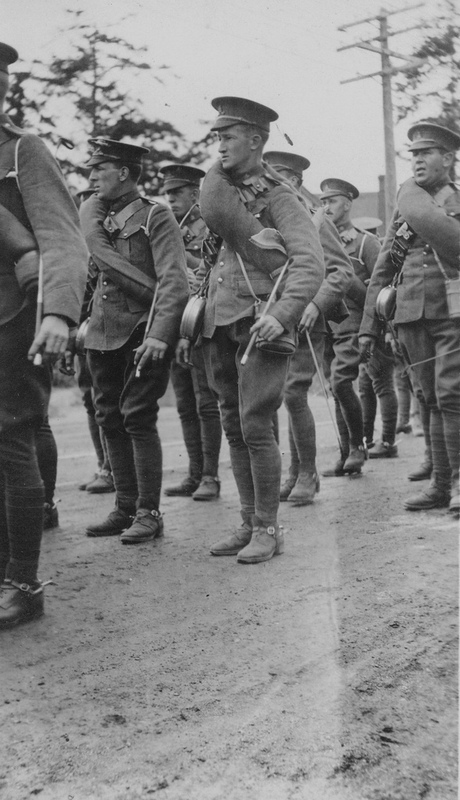 As of today, 275,299 of 640,000 files are available online via our Soldiers of the First World War: 1914–1918 database. Please visit the Digitization of the Canadian Expeditionary Force Service Files page for more details on the digitization project. Latest box digitized: Box 4617 and Hunt. After suffering losses during the War of 1812, they left Ontario for Michigan in 1821. This book discusses the lives of Jacob, his wife, and their children in those early years. 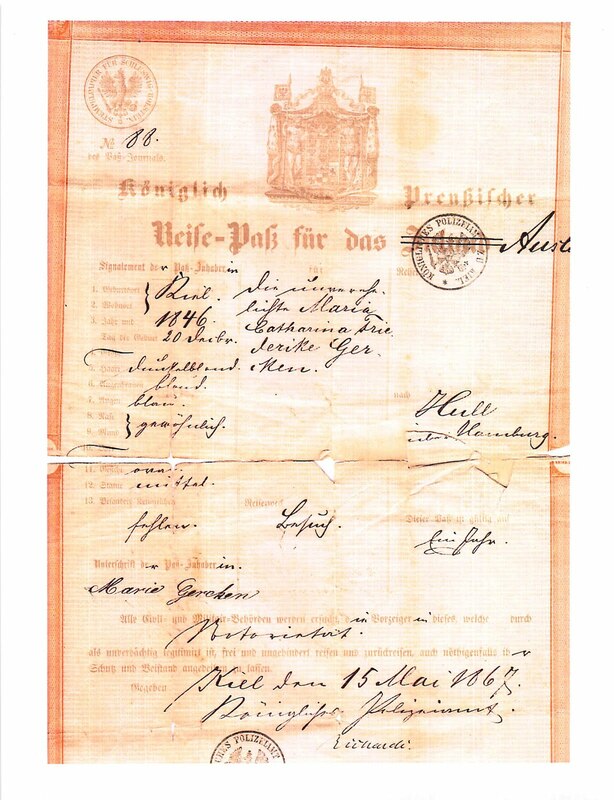 Descendants will enjoy seeing early documents such as land petitions, family photographs, probate records and wills. Katey Sagal lost her parents at a young age and has no family to fill in the blanks of her ancestry. She goes on a journey to understand her beloved mother’s life as a performer for the USO during World War II, and gets emotional connecting for the first time with the only person she’s met who knew her mother when she was young. Then she digs deep into her roots, uncovering a surprising link to early American Amish settlers, and discovers the shocking story of a fierce attack her ancestors endured. She finds her family torn apart and struggling to reconnect after years of separation, which challenges her own morals on motherhood. 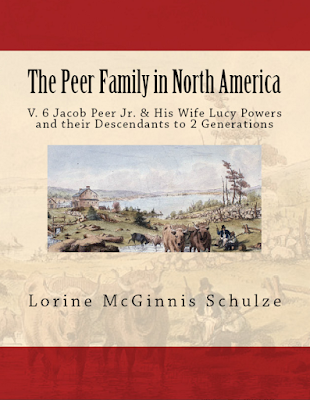 The Peer family, loyal to the British Crown, suffered from persecution in New Jersey throughout the American Revolution. 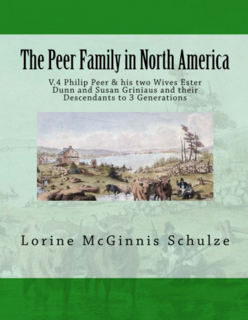 Philip Peer and his family left Sussex County New Jersey for Upper Canada in the summer of 1796. 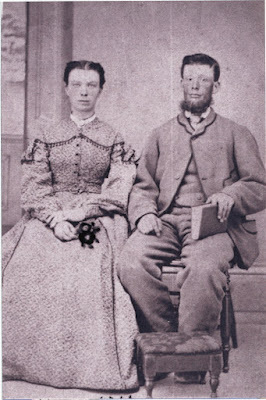 After his first wife Ester Dunn died Philip married Susan Griniaus. This book discusses the lives of Philip, his two wives, and their children and grandchildren in those early years. Descendants will enjoy seeing early documents such as land petitions, family photographs, newspaper clippings, and wills. Have you been to Past Voices: Letters Home? 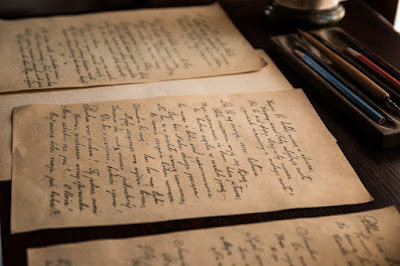 Past Voices gives our ancestors a voice - and these voices from the past come alive in their letters. 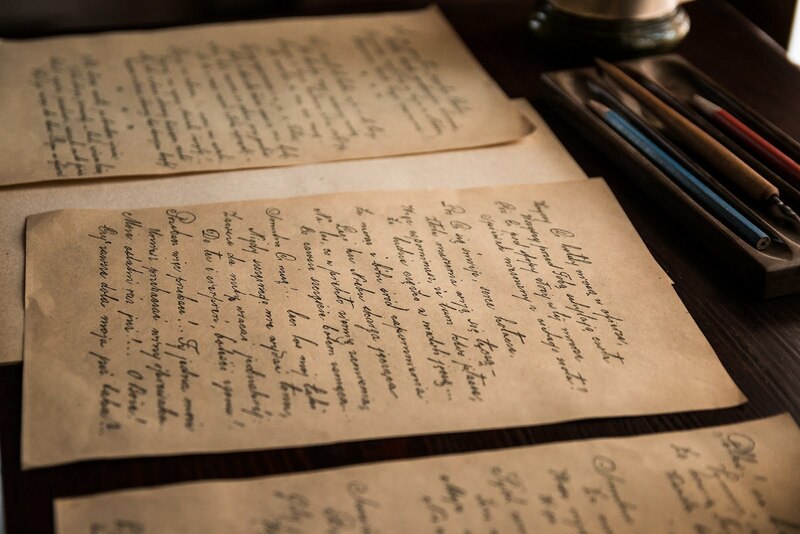 Letter writing has long been an important mode of interpersonal and official communication. As long ago as 3500 BC, Sumerians sent "letters" written on cuneiform tablets in clay "envelopes". Letter writing flourished in the seventeenth century in Europe and it was an extremely important form of communication. As public postal services were established letter-writing increased even more dramatically. Many letters on Past Voices are from soldiers far from home. Nothing tells the true reality of war more than the simple writings of the common soldier. These poignant letters from lonely men to their mothers, wives or sweethearts will touch your heart. Some letters will leave you bewildered by their unemotional telling of horrors almost beyond our comprehension. "Our Heavenly Father has again saved your son Lucius safely through another battle ..."
"The water was very cold--it makes a fellow’s feet and legs ache, I tell you!" "James Ingles was hit on the leg, and a man named Winks in our camp, and another German, was shot through the head (named Stinall) and another tent-mate of mine was hurt in the ankle. Our Major was slightly wounded in the leg. Capt. John Broaht, I hear, had his finger shot off, but I have not seen him yet." On Past Voices you can find your roots and hear your ancestors' words across the generations. Add branches to your family tree as you find your genealogy. You can also learn how to find and preserve old documents, family treasures and heirlooms. 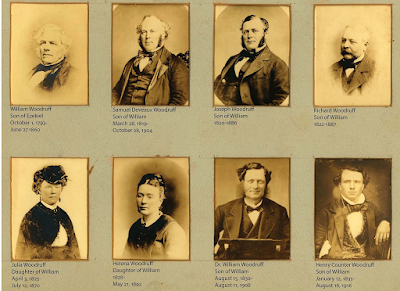 Are You a Peer Descendant? Don't miss the new books! 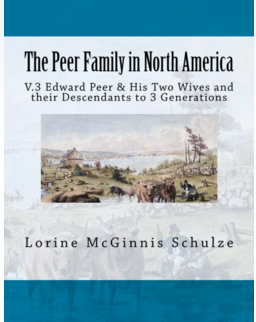 Edward Peer, son of Jacob, came from New Jersey to the wilds of Upper Canada (present day Ontario) in 1786 with his first wife Anna. By 1820 he and his second wife Sarah left Ontario for Pennsylvania. He died in 1834 in Erie County Pennsylvania. This book discusses the lives of Edward, his two wives, and their children and grandchildren in those early years. Descendants will enjoy seeing early documents such as land petitions, family photographs, newspaper clippings, and wills. 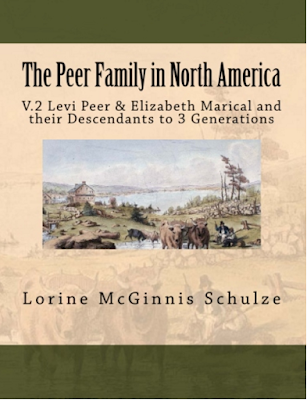 Levi and his family left Sussex County New Jersey in 1801 to join his parents and siblings in Upper Canada (Ontario). Shortly after the War of 1812, Levi and family left Canada for New York, then Pennsylvania, and eventually Illinois. One son returned to Canada. 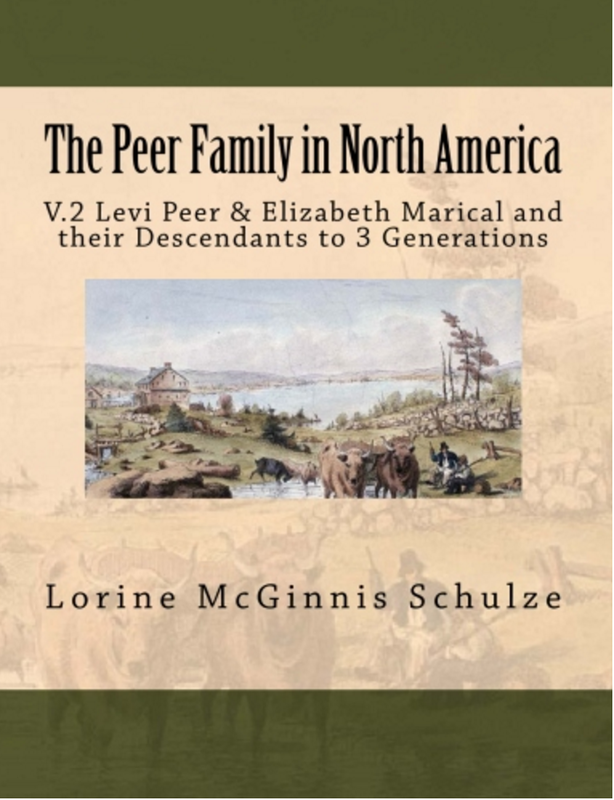 This book discusses the lives of Levi, his wife Elizabeth Marical and their children and grandchildren in those early years. Descendants will enjoy seeing early documents such as land petitions, family photographs, newspaper clippings, and wills. Do you think your ancestors stayed in one place? Guess again! 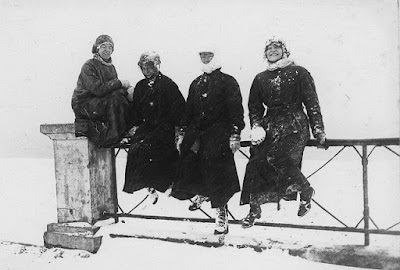 A prevalent myth among genealogists is that our ancestors could not, and did not, travel freely. The truth is that many of our ancestors traveled frequently. They were much more mobile than most of us realize. 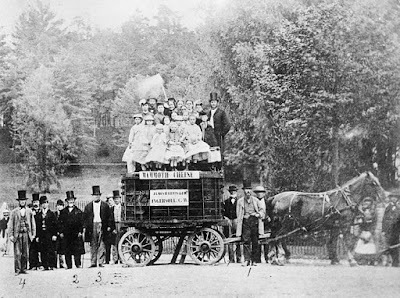 When you look across the centuries, you can find examples of our ancestors’ frequent trips in times when travel was difficult, slow, and often expensive. 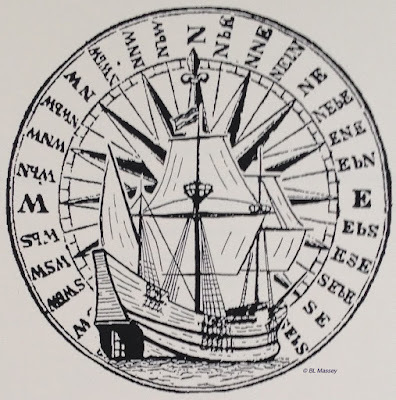 While it may be true that our immigrant ancestors returned home more frequently in later centuries, after ships’ travel became faster, easier, and less expensive, we should not assume this is the case. I have found many 17th century immigrant ancestors who frequently sailed back and forth from their new land to their homeland. Read the rest of my article at How Mobile Were Our Ancestors? Be sure to watch this Sunday’s episode of Who Do You Think You Are? featuring actor Scott Foley. 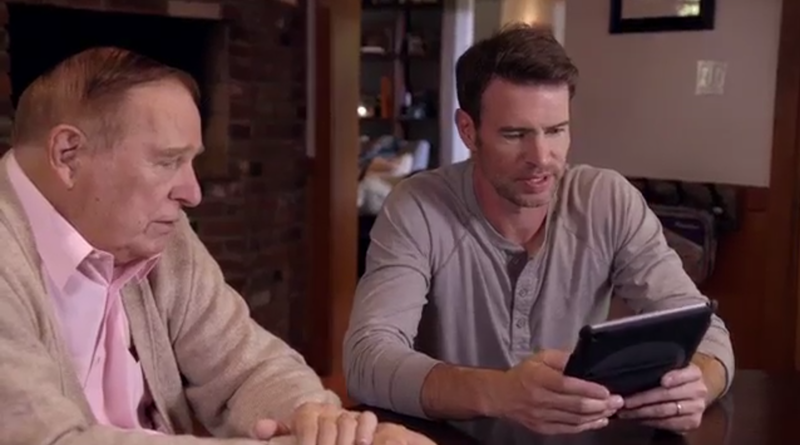 Scott Foley is deeply patriotic but doesn’t know anything about his American roots. He sets out to investigate family lore about a Revolutionary War hero and to his surprise, discovers an ancestor who put his life on the line for George Washington. Digging deeper, Scott then uncovers the shocking tale of a relative who was entangled in the Salem Witch Trials! Labels: Ancestry.com, Revolutionary War, Salem Witch Trials, WDYTYA, Who Do You Think You Are?